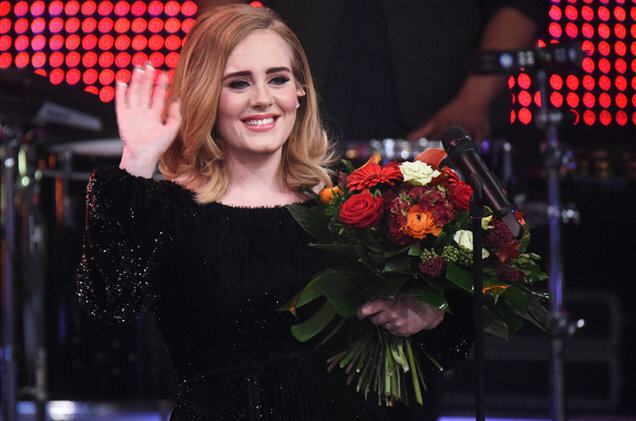 Adele is the proud winner of the most coveted awards at the evening of the BBC Music Awards 2016. Taking place on December 12, 2016, the ceremony witnessed the "Hello" hit-maker taking the honor of winning huge prizes in the categories of "Album of the Year" as well as "Album of the Year". Adele's winnings were for the hard work she did for her album " 25" and the famous song "Hello", and she believes her continuous dedication to hardworking has earned her this year's album and song awards. However, Adele couldn't attend the ceremony, and so her friend Robbie Williams was invited to accept the award for “Album of the Year" on her behalf. He read out the thanking note that Adele had sent with her friend. Adele said in the note that she was feeling a bit bad for winning the award in the category of “Album of the Year” because the album had been out for long and she thinks it was noticed a bit late. But the audience knows Adele Ioves them, has always loved them you and will always love them. Adding his own congratulations, Williams stated it was an honor for him to accept this trophy on his friend's behalf. Her "25" is a beautiful album and she is an incredible artist and deserving winner. Adele is an amazing mother as well and he believes she is the hardest working mom in the showbiz industry today. Geri Horner, one of former Spice Girl's stars took the opportunity to step in the stage for receiving the song award for Adele's "Hello". Pregnant Geri accepted the award on singer’s behalf and with a thanks, invited Adele to join her for tea someday. In addition to the aforementioned victories, Coldplay earned the award in one of the most coveted categories at the BBC Music Awards and claimed the trophy for "British Artist of the Year". Chris accepted the award along with his band mates through a video message that was displayed on the stage for the audience of Melbourne's Etihad Stadium in Australia. Addressing to the crowd presented at the show, Chris Martin said, they just came to know that they had won the beautiful award in the category of "BBC Artist of the Year". He also excused the audience for not being there at the occasion of accepting the trophy. Martin said they were sorry as they were not there to receive the award in person, but they were about to come to Australia for a couple of concerts very soon. He said they love everyone sitting in the audience and who love them. The band is grateful for their love and support and would see them soon right there in Australia. The ceremony was kicked off with the lively performance of "The 1975" who played a version of "the sound", one of their hit songs. Williams was the last performer of the BBC Music Awards while John Legend, Lukas Graham and Craig David were among other performers of the show.